Do you still have snow? Is the sap running? Have you seen mergansers on the river? These familiar questions are heard at the post office, the Creamery, the market, and at community dinners in the early spring. It was a bright morning last April, when I saw pink sprouts pushing up through the cold earth. Within a week, there were pink stems topped with dark green leaves. Rhubarb! It would be the first harvest from my garden. Along with the phoebes that nest in the rafters of the barn, it’s rhubarb that announces the arrival of spring in Vermont. A lilac bush, a clump of rhubarb and a stonewall may be all that remains of a homestead abandoned a hundred years earlier. The dark green leaves, full of oxalic acid, are poisonous but the bright pink or drab green stems are loaded with flavor. It doesn’t need much attention, an occasion scoop of well-rotted manure and cutting back the flowering stalks when they appear will keep the harvest coming until early summer. Technically rhubarb is a vegetable, but I think of it as a fruit that can be roasted and topped with a dollop of yogurt, baked in a pie or simmered with dried fruit to make chutney. Roast at 175-degrees C / 350 F degrees for 30 minutes, until tender and surrounded with sweet pink syrup. Poured in a generous splash of heavy cream, added a sprinkle of freshly grated nutmeg and returned it to the oven for ten more minutes. I like to eat it still hot from the oven, with an antique silver spoon that was my grandmother’s, but no one has complained when I have served it chilled as dessert or topped with granola for breakfast. Rhubarb from the garden with cream from a Vermont dairy and local maple syrup is eating local at its best. 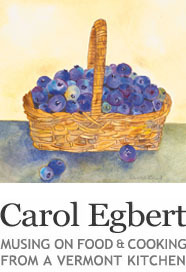 Click here to receive an email notification of my next post and to subscribe to the newsletter from Carol’s Kitchen. I have a rhubarb plant too. I added some blah pear chunks to some rhubarb and cooked them together. Made the pear taste much better – ate it on oatmeal. Sounds great, I am totally into oatmeal, quick cook, steel cut with berries and walnuts, every morning. Oh sigh, this makes me yearn for our garden greens to grow FASTER! Despite our nice weather and its encouragement of our greens to grow, I do wish it could somehow fast-forward itself so that I could pull something from the soil and use it! Rhubarb is such a versatile ingredient. 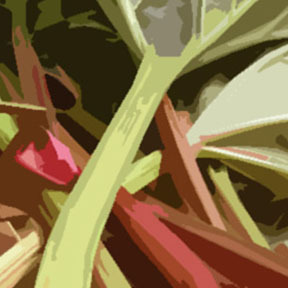 I did Swiss Chard this year, but do want to do rhubarb, as it always comes back and grows quite happily in our rainy Pac NW weather! Not tomorrow, cause no time to go shopping…..but maybe next week, for sure. I did make up with oven baked berries – but something was missing! Ciao Carol! The pie sounds wonderful! Tomorrow early in the morning I’m going to the Market;always makes me think of you.Love your paints & thanks for the gift (pin-print). You’re very welcome, I post the chutney label soon. Is it welcome back to Woodstock? I’m still back and forth to New York, but planted some asparagus up there last week. 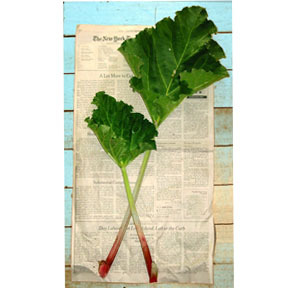 I would love to plant some rhubarb in my garden. Any ideas, suggestions? Thanks for giving us all a taste of Italy. Sounds like it was a great trip. I’d be happy to give you a rhubarb plant when we get back. Looking forward to being in Vermont. Who would have thought of having it with chicken, good idea and one I will be trying. Happy Spring .Ps. maybe with dried chopped apricots in the chutney? Chutney is one of those things that invites creativity. Welcome back! I have also been a busy rhubarb cook-I made simple syrup, a similar chutney, bellinis and rhubarb simmered with white wine and a little sugar. Too bad I have to buy mine from the store. I will have to try it with chicken, sounds tasty!